A Greek gift, which in today’s world would mean from one’s adversary, refers to giving something away with the intention of causing harm to the recipient. On Jan. 2, to commemorate the 40th anniversary of Beijing’s unification statement on Taiwan, Chinese Communist Party (CCP) president Xi Jinping did precisely that, delivering a very long New Year’s speech to woo Taiwan into accepting reunification. While redefining the so-called “1992 Consensus” as “one country, two systems,” Xi elaborated five policies toward Taiwan: 1) realization of peaceful reunification; 2) reunification under the “one country, two systems” framework; 3) insistence on the unwavering One China policy; 4) promotion of greater bilateral cooperation/development; and 5) promoting cross-strait recognition of peaceful reunification. Reunification under Xi was his New Year’s “gift” to Taiwan, which he assumes yearns for a return to the heartland. The outbreak of deadly African swine fever in China has led Taiwan to ban pork imports from China; yet Chinese infected pork products are reportedly still being smuggled to the island. It’s been widely reported that Taiwan’s Kuomintang (KMT) politician Su Chi coined the term “1992 Consensus” (one China policy, but with the two parties allowed different interpretations) after a meeting between quasi-government delegates from the People’s Republic of China (PRC) and the Republic of China (ROC). The KMT acknowledged the existence of this “1992 Consensus,” while insisting that the so-called “one China” refers to the ROC only, with mainland China being part of it, while Beijing asserted that only the PRC represents China, with Taiwan being part of it. Meanwhile, the opposition party to the KMT, the Democratic Progressive Party (DPP), denied the existence of the “1992 Consensus,” as did Lee Teng-hui, the president of the ROC in 1992, who was at the time with the KMT but later was expelled. Su reportedly admitted in 2006 that he made up the term. “We have never accepted the ‘1992 Consensus,’” Tsai contends. She called for international support for Taiwan’s de facto independence after Xi threatened to resort to force, when necessary, to enable the island’s reunification with the mainland. Despite the deeply divided politics between KMT and DPP in Taiwan, most Taiwanese people prefer to maintain the status quo and Taiwan’s sovereignty, rather than succumb to Beijing’s repressive communist dictatorship. Although Chiang recognizes the “1992 Consensus,” he added that the one China policy only refers to the ROC, not the PRC. 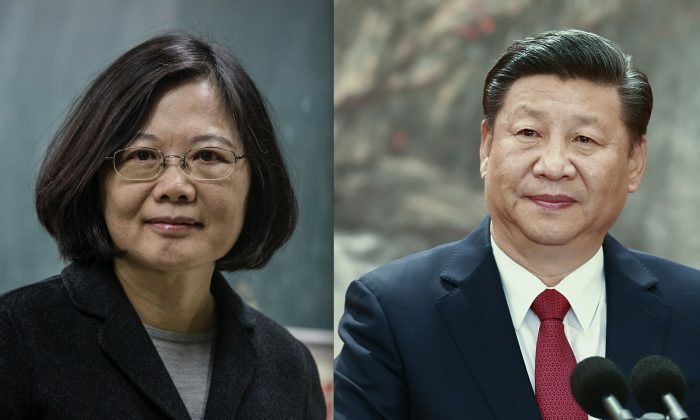 In responding to Beijing’s pressure, Tsai, on Jan. 2, countered with “four musts” required to enable positive cross-strait relations to move forward: 1) Beijing must recognize the existence of the ROC/Taiwan; 2) Beijing must respect the preference of 23 million Taiwanese for freedom and democracy; 3) Beijing must resolve bilateral differences as a peaceful and equal partner; and 4) Beijing must negotiate with the government of Taiwan or an entity authorized by it. In 1979, Deng Xiaoping first put forward the idea of “one country, two systems” for Hong Kong. “Peaceful reunification” and “one country, two systems” have, since then, become Beijing’s official position toward Taiwan. With his personal legacy at stake, Xi might have the ambition, as a New York Times op-ed suggests, to take Taiwan by force during his reign, especially when diversion is needed from mounting domestic crises. In 2017, the Rand Corporation forecast that Beijing might take military action to regain Taiwan around 2020 and most likely succeed in that effort. This outcome, of course, depends, to a large degree, upon how much the United States would intervene in case of an armed conflict. If anything, the so-called “one country, two systems” policy for 50 years in Hong Kong was proven to be a failure only a decade after its handover to China from Britain, according to Chris Patten, the 28th and last governor of Hong Kong. With more than 50 percent of Hong Kong’s youth now considering emigration overseas, according to a poll by the Chinese University of Hong Kong, freedom of expression and association under Beijing’s watch is no longer what it once was. Economist Intelligence Unit rated Hong Kong’s 2018 democracy index at 73rd in the world, slipping seven places behind Singapore. Taiwan, on the other hand, is ranked 32nd, while China holds a dismal 139th place. Since the 2014 “Umbrella Revolution” in Hong Kong, when thousands of students staged a series of sit-in street protests against Beijing’s interference with local politics, the government’s repression of dissenting voices has escalated. Reports have been confirmed of mainland Chinese security agents crossing the border to kidnap Hong Kong residents, including a few book publishers, and taking custody of them inside China. For decades, Western panda-huggers, including Wall Street executives, academics, and policy makers, have been rewarded by the CCP with a variety of favors for their assistance in legitimizing its dictatorship in mainland China. These advocates often refer to the so-called “Asian Model” and Confucian traditions as justifying grounds for saying that democracy isn’t at home in China. If success stories of democracy in South Korea and Japan (both with Confucian traditions) aren’t convincing enough for these apologists, the very existence of Taiwan as an open society governed by the rule of law has effectively attenuated their faulty premise. Taiwan’s thriving open society demonstrates that democracy isn’t incompatible with the Chinese people or Confucian traditions. Although Taiwan has diplomatic relations with only 16 U.N. member states and the Holy See, Taiwan passport holders enjoy traveling to 149 countries without visa requirement (vs. 74 countries for the mainland Chinese), according to the Henley Passport Index released on Jan. 9. Despite China’s population being 58 times that of Taiwan, its total national income is only 10 times greater than Taiwan’s. The 2018 GDP per capita is $25,534 for Taiwan and $10,200 for China, while 2017 average life expectancy is 80.4 years in Taiwan and 76.5 years in China. With respect to the Global Competitiveness Index, Taiwan is 15th while China lags in 27th, according to the World Economic Forum report. More significantly, Reporters Without Borders lists Taiwan in 42nd place in the 2018 World Press Freedom Index while China is in 176th place, better only than Syria, Turkmenistan, Eritrea, and North Korea. While many cultural and religious traditions are subject to repression in China, they are legally protected and remain vibrant in Taiwan—including traditional Chinese characters, Buddhist and Taoist practices, Falun Gong, and Tibetan heritage. Throughout 5,000 years of history, the Chinese people had never breathed the fresh air of democracy until 1996, when the first direct presidential election took place in Taiwan. In addition, the year 2000 witnessed the first change of ruling political parties through free elections, marking a high degree of maturity for democracy in Taiwan. China’s reunification with Taiwan is perhaps a matter of time; yet only when the people from both sides of the Taiwan Strait come to the same understanding, can it take place with a happy ending for all. Certainly, it shouldn’t be up to the communist dictatorship to decide, in this day and age, how more than a billion people should live their lives. The Chinese people want to be free, just like the people of Taiwan are. Peter Zhang focuses his research on political economy in China and East Asia. He is a graduate of Beijing International Studies University, Fletcher School of Law and Diplomacy, and of Harvard Kennedy School as a Mason Fellow. Is the Huawei Lawsuit the Start of a Legal War? Huawei, accomplice to the CCP's human rights abuse, sees no shame in using American judicial independence in an attempt to challenge U.S. legislation. Billions of dollars in foreign capital will eventually make their way to the Chinese Communist Party (CCP), its security apparatus, and its military apparatus. What Will China Do With Your DNA? The Chinese regime has adopted an oppressive campaign to extinguish the religious and ethnic identity of the Uyghur people.